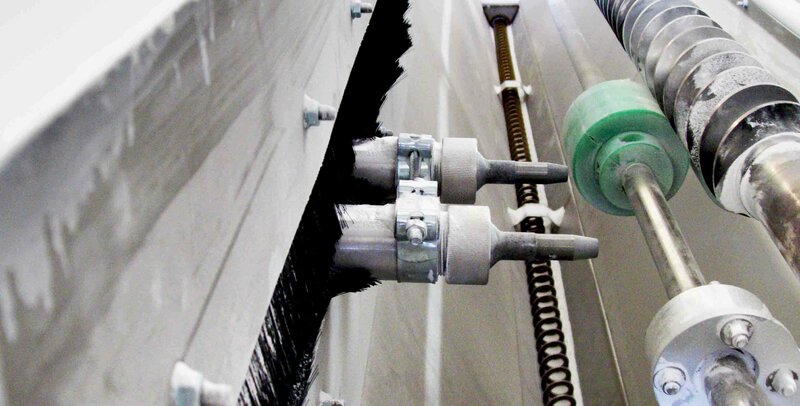 TECNO SUPPLY is an IBIX division that develops anti-corrosion coatings, flame spray of concrete and metal structures and surfaces, technologies that can be implemented on automatic lines. An internal technical research department is committed to develop these cutting-edge systems that put together the highest technological level and the effectiveness of standard machines. IBIX can provide the best solution in numerous fields of work offering sandblasting and shot peeling rooms, customized both in dimension and use; the versatility of IBIX technology is expressed also through these products, able to operate with different blasting materials for various purposes, for example marble production, extrusion screws cleaning, wood treatment, technical components for mechanical industry treatment. The TECNO SUPPLY division produces plants for the automation of the anti-corrosion cycle through flame spray; the single-phase lines produced are ecological and able to use various types of technical thermoplastic polymers on any kind of material; these complex automations are used in many industrial fields, for example fire extinguisher lining or anti-corrosion treatment of pipes and buckle arrestors in the oil & gas industry; the plants can carry out every operation of the coating cycle.